In this class teachers begin to encourage more independence since children are now in younger 2’s. Students in this classroom are aided in the potty training process and gain valuable self-help skills. 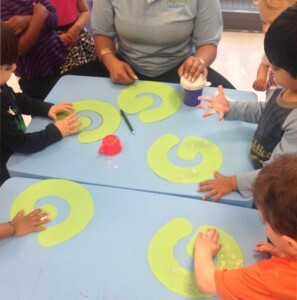 During circle time they increase their number sense, literacy, and fine and gross motor skills. We incorporate daily activities to encourage not only motor development, but also healthy habits. By introducing each child to play, exercise and crafts we work to develop new skills, creativity and confidence! This is also the age when children become curious and begin to expand socially and cognitively. Our supportive and encouraging environment allows them to develop solid social skills as we continue to work on language through reading, speech and arts. At this age your child is starting to understand the relationship between objects. For example the task of matching similar shapes will become an accomplishable activity. Children will also begin to recognize the purpose of numbers in counting objects, and become much more interested in winding up toys and turning lights and appliances on and off. Children’s play begins to become more complex. Children will start stringing together different activities to create a logical sequence. Instead of drifting randomly from one toy to another, he may first put a doll to bed and then cover it up. Or he may pretend to feed several dolls, one after the other.